he is mistaken for a hired killer by some bad guys, a conspiracy begins to unfold. It seems there are a group of people planning to assassinate the Governor of Alabama (we were able to piece that together because this AIP production, like Raw Nerve (1991), was shot in Alabama, and the local paper, the "City Press" announced there was going to be a "Governor's Convention" on its front page). Phillips is confused, and even more so when Justice Department agent Richard Morgan (Davi) wants him to continue playing the part of "John Logan" so he can ensnare the rest of the nefarious organization and prevent the assassination. Add to that Phillips' lawyer/girlfriend Katherine (Tilton) who is trying to help him but gets swept up in the confusion, especially when Alessandro (Hopkins) is poking around wanting answers. And where do Stephen Moore's (Curtis) true loyalties lie? Needless to say, there are many, many twists and turns and you don't know who is double-crossing who. Sure, a lot of it doesn't make much sense but who is really monitoring this very closely? 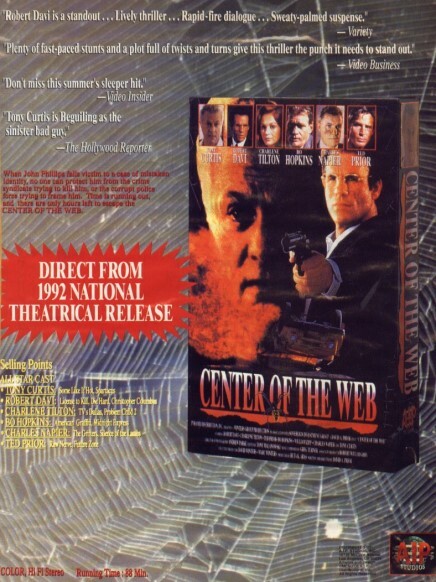 It appears that Center of the Web was one of AIP's attempts at striving for better. They were obviously trying to move away from junkiness and do something a little classier. For the most part, we would say they were successful, if the goal was something less silly. But is that what people really want? The weirdest thing about this AIP film was its pacing. It seemed weird and offbeat, perhaps not on purpose. Hard to say. But all the usual suspects (the Prior family and the Winters family) in the making of the film, seemed to look to Hitchcock for inspiration, The Wrong Man (1956) and Topaz (1969) in particular. I'm sure you could imagine "AIP Does Hitchcock", and here it is. Tony Curtis is here for some reason and the main thrust of his character is he compares people to pigeons and always wears black gloves and a huge belt buckle. The large-faced Prior as the main character, John Phillips (it always seems like the other characters in the movie leave out the word "Sousa" when referring to him) never misses a chance to go shirtless. Groan. The standout actor/performance has to go Robert Davi. He's usually great and he rises above the rest here. Interestingly, Charles Napier is top-billed but has about a five second cameo. Whoopi Goldberg got more screen time in Beverly Hills Brats (1989). The movie could have used more Napier. But AIP must have figured they would fill the cast with names and semi-names, and THEN realized they couldn't fit them all in the movie. Would you want to see a three-hour Center of the Web? I didn't think so. So Napier had to be sacrificed, apparently. The stand-out scene in the film is the one and only action/stunt sequence. We won't spoil it, you'll know it when you see it. It's actually very impressive. For a more "mature" AIP experience, try Center of the Web.